Provocative title, you say? The debate about the benefits and drawbacks of consuming caffeine has become heated, to say the least, since 2011 when we started Caffex™. No question, with CaffeinAll™ we are smack in the middle of it. So we are either good or "evil" (or both?) depending on who you believe in. So we figure that the best way to handle this situation, and our part in it, is to present both sides equally - and let YOU decide. According to this article by Diana Gitig in Ars Technica, it is so essential that the ability to produce it evolved twice in the coffee plant. An international team of researchers, spanning both coffee growing and coffee consuming regions of the globe, sequenced Coffea canephora, one of the parent strains of the heavily cultivated C. arabica. They found that the plant has extra copies of genes called N-methyltransferases (NMTs), which encode a class of enzymes that mediates the late steps in caffeine biosynthesis. Coffee has a total of 23 NMT genes, which arose primarily via a series of gene duplication events. The collection of duplicated genes is distinct from the ones found in tea and cacao, two other caffeine-producing plants that are more closely related to each other. That suggests that these two lineages evolved the ability to give humans a jolt separately. Coffee's NMTs also exhibited evidence of positive evolutionary selection, indicating that caffeine biosynthesis may serve an adaptive purpose only in coffee. The existence of this convergent evolution in other caffeine producing plants has not explored yet. Read more about it now. A Johns Hopkins University study found that we could, possibly, rely on caffeine to boost memory as well as to wake up. The research was published in Nature Neuroscience. The study tested the memories of 160 people over 24 hours. It found those who took caffeine tablets, rather than dummy pills, fared better on the memory tests. The study involved people who did not regularly eat or drink caffeinated products. You can read the article from the BBC News below. A recent research research study, measuring changes in caffeine consumption rather than absolute intake, found some very interesting results: An increase in coffee intake can help lower the risk for adult-onset diabetes. Read more about it now. An in-depth analysis of how the caffeine in coffee, tea, and other foods seems to protect against conditions such as Alzheimer’s disease and heart disease at the most fundamental levels has been reported by researchers at Universidad Autonoma Metropolitana-Itzapalapa in Mexico. Read more about it now. The jury’s been out for a while on whether or not caffeine is good for the body and its health. It’s been implicated in everything from preventing Alzheimer’s disease to maintaining liver health, and slowing down the maturing process of adolescents to increasing the risk of heartbeat problems. Read more about it now. 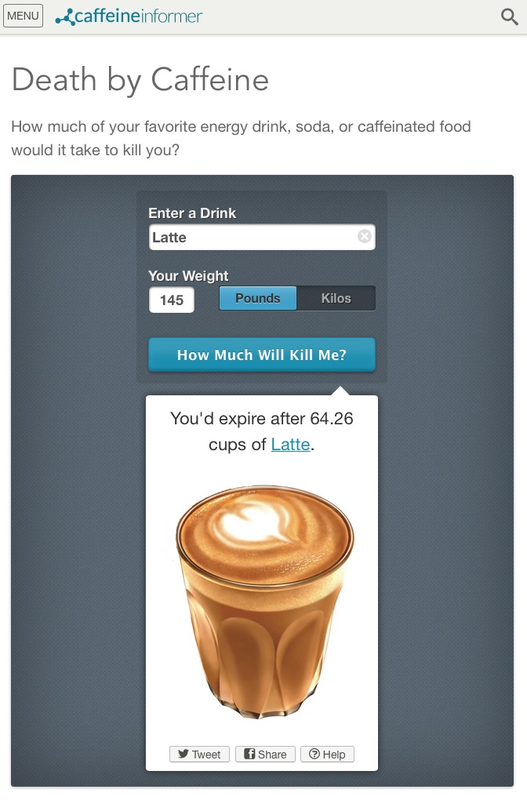 Can you die from caffeine? Of course you can. You can die from too much water too. Actually, too much of anything. We are supposed to learn that, as we grow up. We are also supposed to acquire common sense along the way, like this fact. Is that too much to ask for? Appears to be. At least in the new “progressive” USA. Most of us here just don’t seem to be able to attain the level of critical thinking that’s the hallmark of true adulthood. There are a number of reasons for it, starting with the breakup of the family structure, and culminating in the progressive decline in educational standards all the way through college, that started in the 60s. And yes, I use “progressive” on purpose here. I can go on but you get the picture. That’s why we need people, like Ted Kallmyer, who is the hands, and especially the mind, behind CaffeineInformer.com. They do the thinking for us and give us tools - his is called, somewhat dramatically, “Death by Caffeine” to utilize the knowledge they’ve compiled. It’s an excellent tool. And Ted’s website is a treasure trove of useful information. Combine them and there will be no “Death by Caffeine” anymore. Not for you - if you can help it! According to a scientific paper in Investigative Ophthalmology & Visual Science, heavy caffeinated coffee consumption is associated with an increased risk of developing exfoliation glaucoma, the leading cause of secondary glaucoma worldwide. Read more about it now. A group of researchers at Tel Aviv University’s Department of Molecular Microbiology and Biotechnology, led by Professor Martin Kupiec have discovered that coffee and beer both affect the human genome in opposite ways. Read more about it now. Look at the effect of different drugs on the performance of spiders spinning their webs, according to NASA research reported in New Scientist, 27 April 1995. Read more about it now. Read more about it now.